Prime Minister Sheikh Hasina on Friday held a bilateral meeting with her Indian counterpart Narendra Modi at Bangladesh Bhaban in Shantiniketan. Issues relating to bilateral interests and international concerns came up for discussions, PM's Press Secretary Ihsanul Karim said after the meeting. Earlier, the two leaders inaugurated the Bangladesh Bhaban at Shantiniketan, some 180 km north of West Bengal capital of Kolkata. 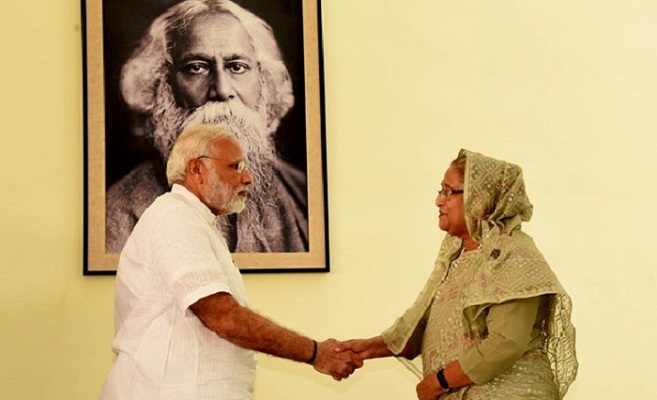 Sheikh Hasina arrived Shantiniketan in the morning on a two-day official visit to India at the invitation of her Indian counterpart Narendra Modi.